Dutchess County Executive Marc Molinaro, Deputy Commissioner of Strategic Planning & Economic Development Ron Hicks and Dutchess County Legislator April Farley joined with City of Beacon Mayor Randy Casale and Beacon Councilman Ali Muhammad for a walking tour of the west end of Main Street in the City of Beacon last week to discuss opportunities at the County’s Beacon Center building on Main Street and talk to local business owners. 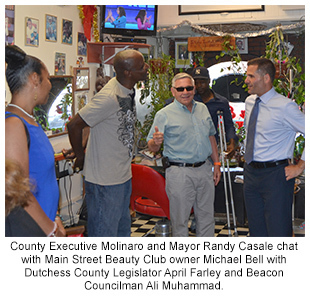 "Mayor Casale and the leaders in Beacon have worked together to promote and improve the city. Our partnerships are helping to move the city forward and provide opportunity for residents and businesses. 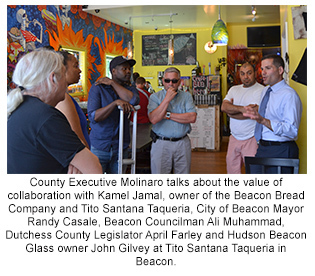 Our visit gave us a chance to talk with residents, employees and business owners about issues important to them - along with identify new partnerships for growth," said County Executive Molinaro. The group met outside of Dutchess County’s Beacon Center building located at 223 Main Street. The Beacon Center is home to the Beacon Office of the Department of Motor Vehicles and satellite offices for several county departments including the Departments of Health and Mental Hygiene as well as the Office of Probation and Community Corrections. The County Executive and Mayor Casale talked about the potential for infill development and the possibility of relocating some of the City of Beacon’s offices to the Beacon Center building to be more easily accessible for city residents. 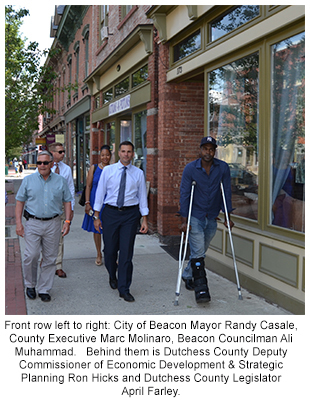 “We have always said that Main Street is the heart of the City of Beacon and it would make a lot of sense to have offices right here on Main Street where it would be easier to walk to for people,” said Mayor Casale. County Executive Molinaro noted the Department of Community and Family Services is working to establish a satellite office in the Beacon Center this fall to assist residents with the Home Energy Assistance Program (HEAP) and other services. One of the collaborations is the Common Greens Garden at Tito Santana Taqueria. The garden is located adjacent to the restaurant. 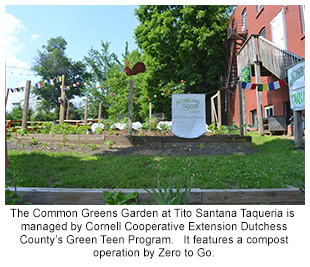 The garden is managed by Cornell Cooperative Extension’ Dutchess County’s Green Teen Program in partnership with Common Ground Farm. The Common Greens project brings reduced priced produce to seniors and low income families in Beacon as well as provides farm to table produce for the restaurant.